A player can use cover effectively to minimise exposure to enemy spotting and enemy fire while themselves spotting (which in turn provides spotting experience) and attacking the enemy. View more effective ways of spotting and attacking using cover below. A player who positions their tank on the crest of a hill has the advantage of a clearer view and potential chance to spot enemy tanks, perform long distance attacks, and call in artillery strikes. However there are also disadvantages to this technique such as potentially exposing the lower frontal glacis armor of the tank and hence be vulnerable to attack. The risk is amplified if multiple enemies are in firing range to the player's tank. Another disadvantage is the player may not be able to attack enemies that are close to the hill as they will not have sufficient gun depression without further exposing their tank. 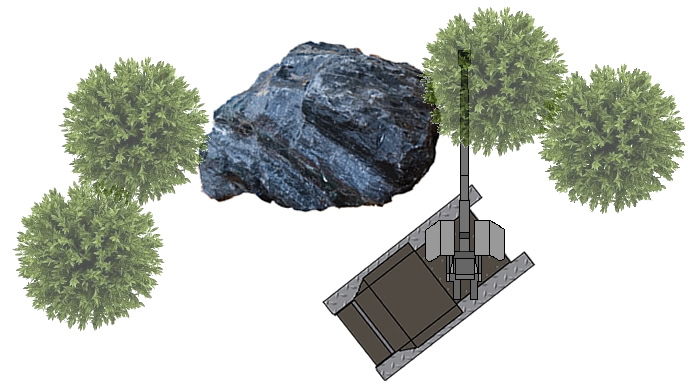 Risks can be mitigated by positioning the tank further back on the hill line, using bushes for concealment, and / or solid cover like rocks for protection. Bushes and fallen trees only provide concealment from the enemy and great for enemy spotting BUT offers no protection whatsoever from enemy fire. Combined with various camouflage items a tank behind a bush can remain hidden for long periods of time while striking the enemy. Bushes and fallen trees are transparent and depending on the density and type of bush or fallen tree will offer different bonuses to the player's tank camouflage rating. Bushes are cumulative, that is the more bushes in front of the players tank the better the bonus while not shooting. Once the player fires the bonus from bushes within 15 metres of the players tank declines significantly. WRONG ... The tank is completely exposed and easily spotted by the enemy. The player must not have any part of the tank hull exposed! Note: Depending on the size of the bush and the length of the gun barrel the player's view in sniper mode may be obstructed by the bush itself. The player needs to find the right balance between concealment behind the bush and exposure of the barrel. Solid cover offers little concealment from the enemy as the turret is exposed allowing the enemy to spot the player's tank however solid cover does offer significant protection from enemy tanks. The exception is enemy artillery which may still be able to hit the player. There are a number of solid cover techniques for players to use. Turret Down Frontal Spotting - Involves peering the Commander's Cupola over a hill or ridge line front on to the enemy. This technique can be combined with the Hull Down technique to shift into attack mode. Turret Down Side Spotting - Involves turning the tank sideways exposing the Commander's Cupola towards the enemy. Popular with Scouts as the player's tank can be on the move driving just below the crest line of a hill making it extremely difficult to be hit by enemy fire. The Hull Down technique is a popular technique amongst tankers whereby the tank's hull is positioned behind a solid object for protection while exposing only the turret. Exposing the turret allows the player to both spot and attack enemy tanks. On most tanks the turret armor in particular the frontal armor of the turret is the thickest and hardest point to penetrate. The downside is once you are spotted the enemy may target weak spots such as the Commanders Cupola or the player's tank may come under artillery fire attack. Hull down can be used behind any solid items including rocks, dead tanks, and hills.